Graeme McDowell and Shane Lowry are in danger of exiting the Volvo World Match Play Championship after losing their matches on day two at the London Golf Club. Both men won on the opening day but defending champion McDowell had no complaints as he lost 2 and 1 to a consistent Mikko Ilonen while Lowry was simply too erratic as he went down by 3 and 2 to French Ryder Cup star Victor Dubuisson. It was just his third defeat in 17 matches at the Volvo World Match Play having previously lost twice to Nicolas Colsaert. Despite going two under on the front nine, McDowell found himself three down and that became four on the tenth. However, the Northern Irishman produced birdies on the 11th, 13th and 15th to close to within one, but Ilonen kept his composure to complete the par four 17th in three shots and take victory. "I did tell people yesterday that I think I have a good chance winning this match," Ilonen said. "I knew I needed to get off to a fast start. I knew Graeme was going to come at me hard, and he did. I needed to avoid mistakes and when I get a good birdie chance I need to make it like I did on 17." McDowell reflected: "I'm disappointed to lose today but Mikko was incredibly solid. I felt like I played the best golf the first five holes but he putted better and that was the difference." McDowell now faces Joot Luiten in his final match in his group knowing he must win to secure at least a playoff for a place in the quarter-finals. The Dutchman followed his opening-day win over Ilonen by beating Frenchman Alexander Levy 4 and 3. "It's a tough one, he's one of the best match players I think at the moment," said Luiten of his clash with McDowell. "But it's going to be a fun day. I'm just going to go out there and try to make some birdies and hopefully I can beat him." McDowell added: "It's a format where you want to control your own destiny. Tomorrow I have a few ifs and buts and whats. I just have to try to beat Joost tomorrow, and that's at least me in a play-off to get into the weekend." Lowry found himself two down after six to Dubuisson and while he won the seventh in par, he lost the eighth and ninth to birdies to turn two down. He won the 10th in par to cut the game but bogeyed the 11th and 12th to fall four holes behind and could only nip one back at the 13th before going down at the 16th. Dubuisson is unbeaten after two matches but the group is wide open after Pablo Larrazábal holed a pitch from the rough for a birdie four on the 18th to beat Stephen Gallacher 1 up. That leaves the Abu Dhabi HSBC Golf Championship winner tied with Lowry, whom he faces on Friday, on two points in the Gabrielsson pool. Despite hitting a Volvo advertising board on the 18th, the Scot looked well set to take the hole with Larrazábal finding the sand and then the rough, but the former Sir Henry Cotton Rookie of the Year stunned his opponent by chipping in from the bank. Gallacher was left with a 15 footer to halve the match but he came up short, ending his hopes of reaching the quarter-final. A thrilled Larrazábal said: "(The hole) looked terrible all the way. Driver to the bunker, I hit a nine iron (but) I pulled it a little bit into the thickest rough on the golf course and I had 50 metres to the hole. I hit a six iron as hard as I could, trying to make five and trying to have a half point today (so I could) go out there and try to do my job tomorrow. "But yeah, the ball was sitting great. I thought I had the chance to putt it close and to make five and to put the pressure on Stevie - Stevie had a good lie - but I holed it and it went in, happy days." World Number Five Henrik Stenson produced a masterclass on the back nine to take victory against Francesco Molinari. The Italian went round in seven under and led by three after four holes, but still saw his chances of reaching the last eight ended by a 2 and 1 defeat to the Swede. Stenson, who halved his opening match against George Coetzee, was two down at the turn, but gained holes at the tenth and 11th to level things up. Molinari birdied the 12th to regain the lead, but Stenson eagled the 15th to move back to all square. Stenson followed that up with back-to-back birdies which secured a stunning victory and set up a showdown with Thongchai Jaidee on Friday. The Swede said: "I felt like I was playing better and better as the round went on. I just figured yesterday I didn't take my chances against George when I had them. "Today I felt I needed to take them and rolled some nice putts in to close out the match, so that was very satisfying." Jaidee, last year's runner-up, missed the chance to book his spot in the last eight as he was beaten 2 and 1 by Coetzee, who moves to three points after another bogey-free round. In the McCormack pool, the four players head into the final group match tied on two points each. Jamie Donaldson recovered from his loss against Paul Casey by beating Jonas Blixt 3 and 2, while Casey fell to a 2 and 1 defeat to Patrick Reed. A delighted Donaldson said: "Today was important to get off to a good start. (I) played well for most of the day and (it is) nice to come up with the victory." US Ryder Cup star Patrick Reed, Francesco Molinari, Pablo Larrazabal, Jonas Blixt and 2006 World Match Play Championship winner Paul Casey, complete the 16-man field for next week's Volvo World Match Play Championship at the London Golf Club. Shane Lowry at Thracian Cliffs. 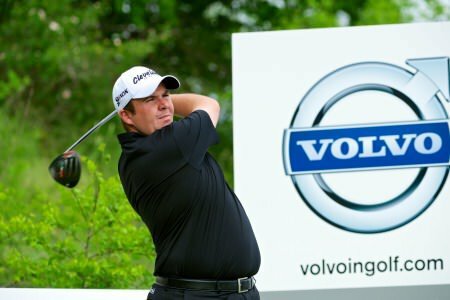 Picture © Volvo in GolfShane Lowry has had the luck of the draw and avoided a first round showdown with Irish stablemate Graeme McDowell in this week’s Volvo World Match Play Championship in Bulgaria. Defending champion Graeme McDowell has welcomed the decision to bring the Volvo World Match Play back to England with the event scheduled for the International Course at the London Golf Club in Kent from October 15-19.